Definition at line 30 of file CZeroSet.h. Definition at line 80 of file CZeroSet.cpp. Definition at line 88 of file CZeroSet.cpp. Definition at line 94 of file CZeroSet.cpp. Definition at line 178 of file CZeroSet.h. Referenced by operator&=(), and operator|=(). Definition at line 95 of file CZeroSet.h. References mBitSet, mIgnoredBits, and CVectorCore< CType >::size(). Referenced by CStepMatrixColumn::getAllUnsetBitIndexes(), and operator<<(). Definition at line 85 of file CZeroSet.h. Definition at line 90 of file CZeroSet.h. 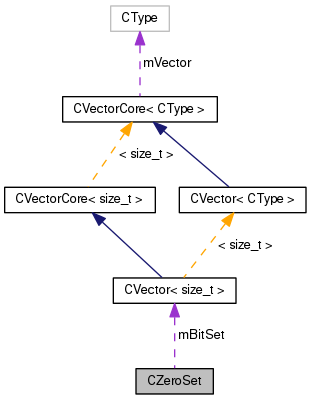 References mBitSet, mIgnoredBits, mNumberSetBits, and CVectorCore< CType >::size(). Definition at line 137 of file CZeroSet.h. Definition at line 97 of file CZeroSet.cpp. Definition at line 80 of file CZeroSet.h. References CZeroSet::CIndex::mBit, mBitSet, and CZeroSet::CIndex::mIndex. Referenced by CStepMatrixColumn::getAllUnsetBitIndexes(), CStepMatrix::getUnsetBitIndexes(), and operator<<(). Definition at line 118 of file CZeroSet.h. References CVectorCore< CType >::array(), countSetBits(), mBitSet, mIgnoredBits, mNumberSetBits, and CVectorCore< CType >::size(). Definition at line 159 of file CZeroSet.h. References CVectorCore< CType >::array(), mBitSet, mNumberSetBits, and CVectorCore< CType >::size(). Definition at line 144 of file CZeroSet.h. References CVectorCore< CType >::array(), mBitSet, and CVectorCore< CType >::size(). Definition at line 100 of file CZeroSet.h. Definition at line 68 of file CZeroSet.h. References CZeroSet::CIndex::mBit, mBitSet, CZeroSet::CIndex::mIndex, and mNumberSetBits. Definition at line 74 of file CZeroSet.h. References mBitSet, CZeroSet::CIndex::mIndex, CZeroSet::CIndex::mNotBit, and mNumberSetBits. Definition at line 114 of file CZeroSet.cpp. Definition at line 172 of file CZeroSet.h. Referenced by CZeroSet(), getNumberOfBits(), getNumberOfUnsetBits(), isSet(), operator&=(), operator<<(), operator==(), operator>=(), operator|=(), setBit(), and unsetBit(). Definition at line 174 of file CZeroSet.h. Referenced by getNumberOfBits(), getNumberOfUnsetBits(), operator&=(), operator<<(), and operator|=(). Definition at line 176 of file CZeroSet.h. Referenced by getNumberOfSetBits(), getNumberOfUnsetBits(), operator&=(), operator<<(), operator==(), operator|=(), setBit(), and unsetBit().